In honor of our #IStandWithFerdinand anti-bullying campaign, for every social media post containing the hashtag #IStandwithFerdinand, Penguin Young Readers will be donating Ferdinand books to The Gentle Barn's literacy program. "For the first time ever.."
The Gentle Barn, in partnership with Twentieth Century Fox and Zevia, have adopted a bull calf and named him “Ferdinand” in honor of the upcoming film FERDINAND, in theaters nation-wide December 15, 2017. Ferdinand has been welcomed with open arms by The Gentle Barn in Santa Clarita, CA., where he will join the family of animal ambassadors who teach children to have kindness and compassion for all living beings. For the first time ever, families and animal lovers everywhere will be able to follow the life of Ferdinand in real-time via ongoing social posts from The Gentle Barn and 20th Century Fox and you can also come visit the California Gentle Barn location to meet him in person. FERDINAND tells the story of a giant bull with a big heart. After being mistaken for a dangerous beast when stung by a bee, he is captured and torn from his home. Determined to return to his family, he rallies a misfit team on the ultimate adventure. Set in Spain, Ferdinand proves you can’t judge a bull by its cover. The Gentle Barn is a place of healing, where children learn that even though we might look different on the outside, we’re all the same on the inside. 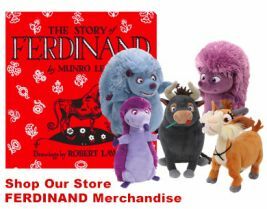 The Story of Ferdinand is so important because it represents the universal idea that each one of us deserves a chance to be who we really are. For almost 20 years, The Gentle Barn has been working with animals and children who share similar stories of struggle and perseverance and for a mainstream media company to distribute a movie that inspires a positive message of love, courage and triumph will not only raise awareness, but will bring about great change. To point, this project has allowed us to save the life of a young bull, Ferdinand, who will grow into a symbol of hope for future generations to know.